I was on my way to the 101 Freeway near the Esplanade Financial Center. I saw two of my friends, Bill Terry and Gloria Roman, standing on the sidewalk trying to get the attention of the people in the passing cars. They had huge photographs of fiery explosions and huge pipes. They got my attention! What the heck was going on? I pulled into the parking lot to talk to them and learned that a behemoth Australian mining company had plans for Oxnard and our precious Santa Barbara Channel. BHP Billiton had decided that Oxnard was to be the sacrifice zone for their dirty money making plan. Why? As we have learned so many times in the past, they did not think that the good people of Oxnard and the region would rise to the occasion and object. After all, Oxnard is a city of immigrants, Spanish speakers, working people; they would be too busy to get the facts. Plus they had been spending lots of propaganda dollars doling out pitiful amounts of money to local non-profits, trying to buy good will and green washing their ugly project. They found local spokespeople who signed on, who did not even ask the affected community what they thought. We were being sold a bill of goods, with statements like “California is going to need natural gas from Asia because we were running out.” Well we know the truth now. There is a glut of domestic natural gas, which continues to pollute our nation and planet. We certainly did not need to be importing it and have a super tanker full sitting there for twenty years threatening our lives and everything in the channel if there was a spill. There were the familiar arguments we are hearing today with a similarly bad idea, NRG’s Puente Project on Oxnard’s coast. “Jobs, renewable and clean natural gas, and great community partners.” Well not so much, only temporary construction jobs that would be building something that our first responders and hospitals would have to deal with if there was an accident. As one person stated simply “all pipes leak. “ Don’t we know that? And natural gas is a fossil fuel, not renewable and certainly not clean. Ask the residents of Porter Ranch who have suffered with the methane leaks that went on for months at Aliso Canyon natural gas storage wells, damaging their health and their property values, perhaps forever. 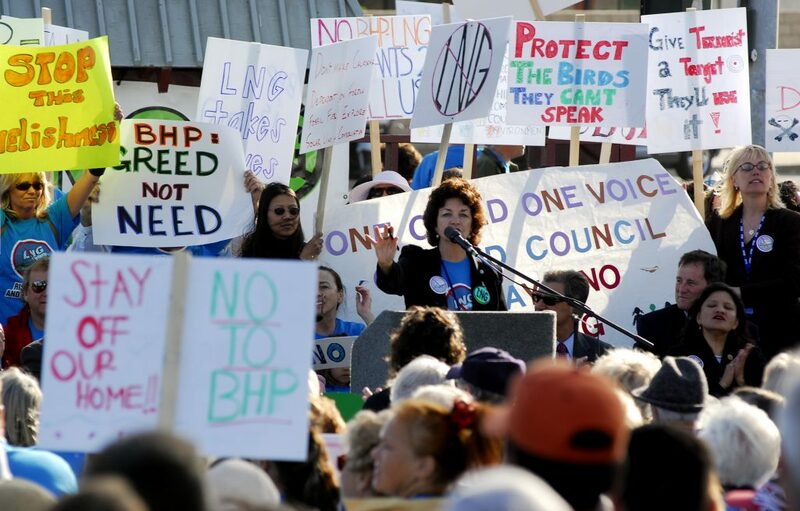 BHP’S Cabrillo Port Liquefied Natural Gas Terminal would be serious danger to our entire community forever. No amount of contributions to our struggling non-profits would compensate for the danger posed. No amount of scholarship money would make amends for the coming abuse and degradation of our city. We found out that the whole thing was rigged, that the governor, some business organizations, other officials and people profiting from the crumbs of money that dripped from BHP thought that it would be as a great idea to put a super tanker full of liquid gas in the Santa Barbara Channel. And the pipe would come ashore after being in the ocean floor, riddled with earthquake faults, across our beaches here in Oxnard and down through our crowded neighborhoods with poor people and their children, churches, schools, businesses, and the one Oxnard hospital serving thousands of people. The only reason was to make profits for the giant mining company, which had left a trail of environmental devastation and human rights violations across the planet. Community organizations like CAUSE, the Sierra Club, LULAC, the California Coastal Protection Network, political leaders like former Congresswoman Lois Capps, and current Congresswoman Julia Brownley when she was in the assembly, Dr. Manuel Lopez, Mayor of Oxnard, Supervisor John Zaragoza while on Oxnard City Council and thousands of individuals from all walks of life beyond Oxnard and Ventura County, got involved. The Environmental Defense Center waged a legal battle with the finest lawyers, engaging the knowledge of the best scientific experts. The case presented to the State Lands Commission and later to the California Coastal Commission would prove that the project was unneeded and would be a devastating blow to our environment and a terrible threat to the health and safety of thousands of people. 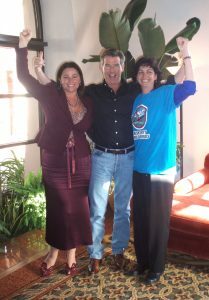 Pierce and Keely Brosnan with EDC’s Chief Counsel, Linda Krop after the 2007 California Coastal Commission hearing. A huge effort was made to get people to the final State Lands Commission hearing in Oxnard. 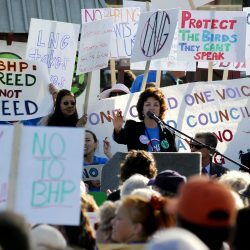 This would be “make or break.” I can remember the feeling of hopeful exhilaration when I saw that thousands of people were there wearing their blue “No LNG t-shirts.” (Thanks to Susan Jordan of the Coastal Protection Network.) The Commission voted 2-1 to defeat the project, ending BHP’s Cabrillo Port plan to get a lease of state lands in the channel. The next step was the Coastal Commission, which met in Santa Barbara a few days later. Once again there was a long hearing, presentations by EDC and others and then a decisive unanimous vote against the project. In April of 2007, Governor Schwarzenegger finally hammered the last nail in the project’s coffin. We celebrated. We know now the power of community in cooperation with youth, organizations, elected leaders, and every day people to make a change when they let their strong passionate and caring voices be heard. This won’t be the last time that we fight and win, and what ever happens we know that we are doing it for the future. There were so many people to thank. And I am grateful to have had the opportunity to participate in this great victory for our community and our world. Thanks Carmen Ramirez for your Leadership protecting our Beloved City, Oxnard from Hazardous Gas Pipelined Projects.